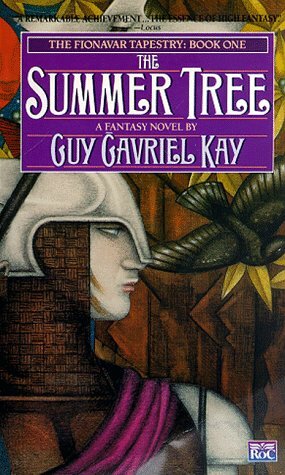 Guy Gavriel Kay (and this series) has been on my mind lately. I'm not sure why. I am sure, however, that the inaugural Retro Friday review was Kay's Tigana, and it makes me happy to have started with that book. But these are the first of his books that I read, and I read them on the recommendation of my husband (then-boyfriend). Which memory also maketh me happy. He'd read them years before and guessed (rightly) that I would love them, too. When I went to the bookstore to pick up the first book, the red trade paperback had just been released. I snatched it up and stroked the cover. It has one of those buttery matte covers that catch ever so softly on your fingertips and make it impossible to stop stroking them. Ahem. It had been a little while since I'd ready any true high fantasy, and it was good to be back again. Though this series does have a bit of the urban fantasy about it to begin with. The main characters are all university students from Toronto. And I liked the fresh combination of segueing from one to the other. 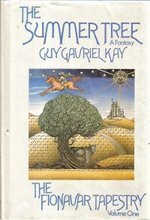 The Summer Tree was originally published in 1984 and was Guy Gavriel Kay's first book. 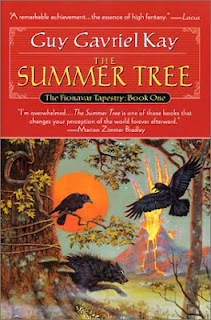 It is the first in the Fionavar Tapestry (I've always loved that series title), which is a trilogy. They are very visceral, very Tolkeinesque in scope, and should most definitely be read in order. Kim, Jennifer, Paul, Dave, and Kevin are friends. They attend the same college in Toronto. And, on one extremely fateful night, they attend the same lecture by a renowned professor. Dr. Marcus even invites them back to his home after the lecture, and that is approximately where things begin to run off the rails. It turns out Dr. Marcus is in fact a mage from another world known as Fionavar. Fionavar is the original world, Dr. Marcus (or rather Loren Silvercloak) informs them, upon which all other worlds (including Earth) are based. He would like to formally invite the five to return home with him, as it is the 50th anniversary of the current king's reign, and celebrations are in order. Confusion reigns as well, and before they know it, the two girls and three boys are far, far away. Thrown into a massively foreign and complex world, they each struggle to find a reason they were called to be there in this auspicious moment in Fionavar's history. Of course, there are a myriad reasons and they each find out (with a vengeance) the precise role they are to play in the violent and mythical conflict that is about to go down. Whether or not they will ever return to their homeland is a question that becomes increasingly irrelevant the longer they spend in this First of all Worlds. After the war was over, they bound him under the Mountain. While this series clearly inherits largely from Tolkein and C.S. Lewis (via The Chronicles of Narnia), I feel it's fair to say that you haven't read a writer quite like Kay. His language is poetic and sprawling, and he has a gorgeous talent for metaphor and poignancy. 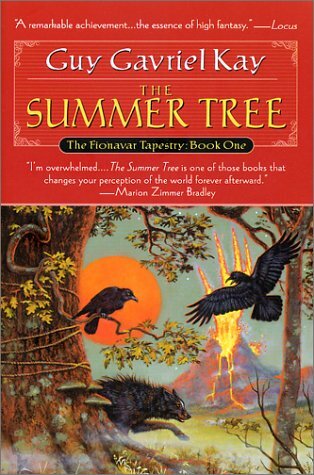 The Summer Tree definitely starts off with a bang, but it took me awhile to get my footing amid Canadian college students suddenly mingling with elves and archmages. It also took me a good number of pages to warm up to four of the five main characters. Paul was always where it was at for me. I liked him from the start, this haunted boy with so much music and loss in his past. It was without surprise that I found he was to have the longest road to walk of all. But warm up to the rest I did, and that is mainly due to the way they care about each other and the way that Kay wove them into their roles. The denizens of Fionavar are, well, awesome right from the start. I particularly enjoyed the politics and the expansive geography of this realm, all of it existing under the shadow of the Unraveller--Rakoth Maugrim. A fallen god himself, his specter taints every interaction in this sweeping tale. The whole thing builds to a ripping good (and excruciating) climax, in which my beloved Paul plays a pivotal role. Things get painful at the end. And violent. And I do mean painful. And violent. But know that it gets better. Also, there is a serious cliffhanger. So I would advise having book two in hand if at all possible. The incredible setup, the world itself, and the final chapters are what make this book. There are quite a few disturbing turns taken as well, and I can only say that the next two installments are thoroughly worthwhile. While I think The Wandering Fire is my favorite (I'm a sucker for middle novels), the entire trilogy is a feat of storytelling. If you're in the mood for beautiful prose and the highest of high fantasy, I suggest a trip to the K section of your library or bookstore. I haven't read any Kay, but you've made a solid case for his works (and this title in particular). I am almost always in the mood for well-written, intricate high fantasy - though these days I prefer a stand-alone because my attention span has grown short. I'll be looking for this at the library! Great review. Also: thanks for the link! Cecelia, I hear that. I'm fond of standalones lately as well. Thanks for participating this week! Loved your review. Oh, my heart. These are some of my absolute favorite books, and just seeing the title of your post made me a little silly-happy. I return to GGK over and over--especially when I'm in the mood for that grand, all-encompassing, heart-wrenching type of experience. Definitely ones to lose yourself in. Jolie, that last line of your comment really made me smile. I can't tell you the impression that dedication in THE LION, THE WITCH, AND THE WARDROBE made on me when I was a girl. I remember Aaron telling me you both read them and loved them. I haven't read any Donaldson actually, though I've heard Mordant's Need is good. I'll look them up for sure now. Love your description of the red paperback! That is exactly how it feels. 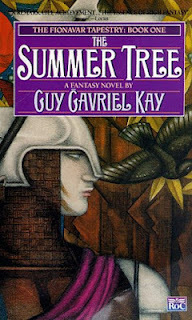 I have a copy of this and the sequel as well as Guy Gavriel Kay's Tigana. Bought copies based on your recommendation but I haven't had a chance to read them yet. I'll probably bump up the Fionavar Tapestry books once I get a copy of the third in the series. Lovely review, as always, Angie. :) Makes me more excited to read this. Ahhh, I love the feel of it! Sumptuous. Yeah, definitely have them all three on hand when you do dive in. TIGANA is always a good idea. Kaye, ooh, thanks for posting! I haven't read any Constable yet, but she's on my radar. If you do give the Fionavar series a go, let me know!